Origin of name: The feathers on its legs and feet give the limbs a “rough” appearance. 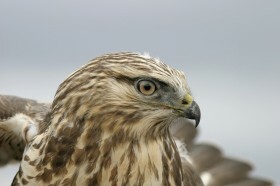 Other names: Black hawk, mouse hawk, squalling hawk. Hunting habits: Preys on mice, lemmings, pocket gophers, cutworms and caterpillars, and small to game-sized birds. Usually takes prey on the ground. Nesting habits: Nests on open tundra and mountainsides. When lemmings are abundant, lays 5-7 eggs, other years only 2-3 eggs. Female does most of the incubating, which takes a month. The young leave the nest about 41 days after hatching. Weight: Ranges from 745 to 1380 grams; females are generally larger than males. In the world of raptors, females are bigger, stronger, and usually more aggressive than males. Life expectancy: One banded bird was shot when 6 years, 9 months old. Another lived 17 years, 9 months.